Béchamel sauce is one of the most interesting preparations we can use in the kitchen: coming from France, béchamel is used in fact in many Italian recipes and the recipe for making it at home enthusiastically entered our tradition. The name comes from Marquis Louis de Bechamel and was assigned to this sauce after King Louis XIV’s chef decided to put it in the menu: since then the béchamel has become famous throughout the world and it also called white sauce. The recipe for the bechamel recipe is simple and the proportions are really easy, 1: 1, but you have to pay attention when making it prevent it from sticking to the pot. If you do not use it immediately, cover the bowl with the béchamel using paper film: this will allow moisture to form which will help the béchamel to not dry and remain usable for 2-3 days. It is possible to freeze the béchamel, when completely cold, inside a glass container and use it within one month of preparation. 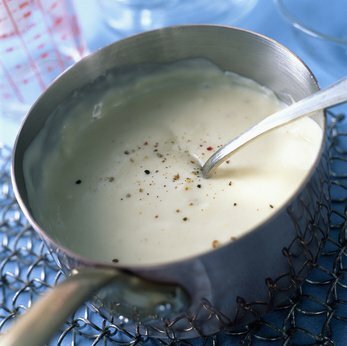 You can flavor the béchamel to taste according to the recipe to be prepared and used. Heat the milk into a pan so that it does not reach the boiling point. In another pan dissolve butter then turn off the flame and add the flour mixing continuously with a whip. Put on a very low flame and, always stirring, make it golden. Once the roux (flour + butter) is ready add the milk by mixing it with a whip so as to avoid the formation of lumps. Add a pinch of nutmeg and sprinkle slightly then let it thicken to a low flame for a total of 5-6 minutes for a medium density sauce and up to 10 minutes for a very thick sauce.